When you first started barbecuing, you grilled only preformed hamburgers and hotdogs – now you’ve graduated to true barbecue. You’ve finally decided that you’re ready to take the plunge and try to smoke a brisket, which is known as one of the most unpredictable cuts of meat in the world. Sure, it will take a lot of time and effort, but we can assure you that it’s worth it in the end – if you do it right. Brisket is extremely tricky to cook properly. You may find it a bit overwhelming at first because of all the steps involved; you’ve got to trim it, smoke it, wrap it, and let it rest. However, don’t stress over it too much. Below you will find all the information you are going to need to take it on. Your meat will taste amazing and everyone will believe you are the master of your BBQ. 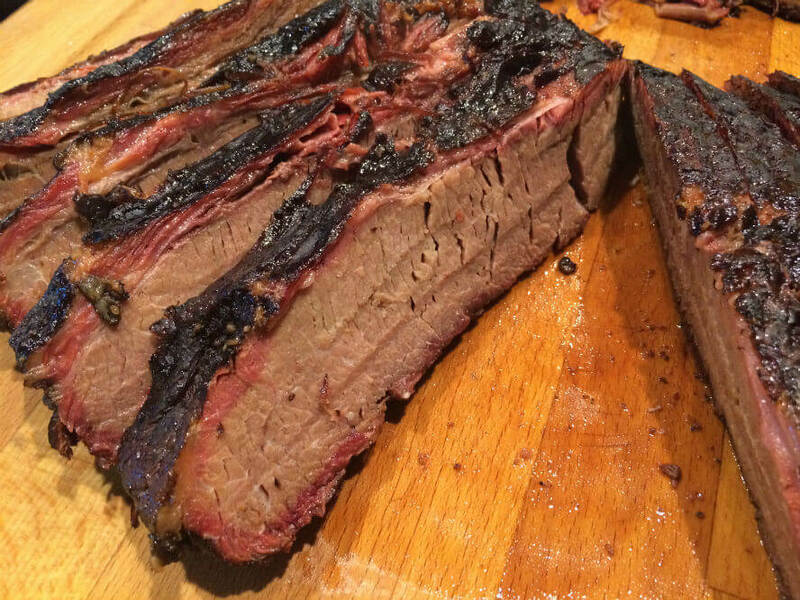 In the world of barbecue, experts say that a good brisket can be folded in half. While it’s true that you’re not likely going to be able to literally fold it in half, a decent brisket will be “floppy” instead of stiff when you are holding it. The flexibility of the meat reveals that there’s a decent balance of fat versus muscle. In addition, the brisket you choose needs to be marbled so the fat will render into the meat, making it tender. Make sure that the flat portion of the brisket (that is, the lean area) is thick enough that it will cook at about the same rate as the point (that is, the thicker area). The truth is, no matter how great the brisket is, whether you get it from your local butcher or a grocery store, it’s going to have a decent amount of fat on it. While it’s true that some fat is required to ensure the meat stays moist during the process of smoking, you will need to trim off most of it so it’s not too fatty at the end. This part – trimming – is one of the most time-consuming portions of cooking your brisket, especially if you’re not very experienced with it. However, here are a few things to keep in mind that should be helpful for you. Start by trying to trim the fat cap – the layer that is covering one side of your brisket – to about .25”. Then, anywhere else the fat seems especially thick, trim it. You will also want to take the time to remove the silver skin from the bottom of your brisket. If you need some extra help, you may want to do an online search to find a video to help you out a bit. When you’re considering smoking a brisket, you’re going to find that everyone has their very own signature rub that they think is the best. If you are one of those people, then go right ahead and season all you want. However, if you haven’t found a rub that you think has a good flavor and a variety of uses, then you may want to experiment to find one you like. Once you have chosen a rub, you’ll need to coat your brisket on both sides and massage it into your meat so that it will stick. You want to avoid using too much. You do want the meat to be covered, but you don’t want it to be caked on there. The absolute best way that you can cook a brisket is to do it low and slow. You need to start by preheating your pellet smoker to 250° Fahrenheit, or Hi-Smoke and then cook it until the internal temp of the meat is 160° Fahrenheit. There are several factors that will affect the cooking time, so the best thing to do is to monitor the temperature instead of watching the clock. For an entire brisket, it’s estimated that you should cook it for about 10 to 15 hours. A digital smoker, or digital conversion kit, will make it easy to smoke your meat. You won’t have to babysit your fire to make sure that it maintains the proper temperature and the pellets are producing the right amount of smoke. You can set a wireless thermometer that will send you an alert once the meat has reached the proper temperature. These days, it couldn’t be easier to smoke a brisket. Once your brisket reaches an internal temperature of about 160° Fahrenheit, it will reach a point known as the stall. This is the point where the internal temperature will plateau, and the meat will release moisture for a few hours. If you continue to cook your brisket, the stall will eventually break, and the temperature will once again start to increase. However, if you don’t have the patience to wait through the stall, you can break the stall by wrapping your brisket with butcher paper or aluminum foil. This process retains the moisture and speeds up the cooking, which is the reason experts highly recommend it. However, if you wish, you can leave it unwrapped and spritz it every now and then to add moisture, but keep in mind that this way it’s much more likely to dry out. Once your meat thermometer is reading an internal temp of 190° to 205°, it’s time to remove the brisket from the heat and let it rest. If you have not already wrapped it, take time now to wrap it in butcher paper or aluminum foil and allow it to rest for about an hour. This will give the juices time to settle in the meat. If you need it to sit longer, you can place it in a cooler to rest for more than two hours. Once your brisket is ready to eat, it will have a dark, mahogany-colored crust on the outside. This is known as the bark. You will take your carving knife and cut it against the grain, into thin slices, approximately ¼” thick. As your brisket begins to come apart, take a slice and hold it up. You will know it’s perfect if it will hold up under its own weight but easily fall apart when you gently pull on it.